PROMStahl PAFP bollards represent a simple, durable and inexpensive way to limit and secure roads and passage ways. Thanks to their high-stability structure, these bollards may be used as an effective means to protect machines, racks, pillars or building corners against vehicle collisions. All protection bollards are stable, hot-dip galvanized steel structures which are also available with an additional safety paint (yellow and black). They can be used inside and outside. 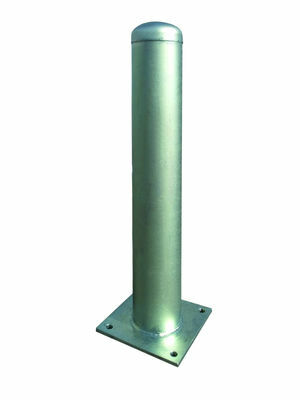 PROMStahl bollards can be safely fixed either by putting them directly into concrete or by means of heavy-duty bolts. They represent a cost-effective and useful investment for protection against collisions. base plate provided with 4 holes with a diameter of 20 mm; to be fixed on concrete by means of heavy-duty bolts.